Compact and free flowering, Camellia Debbie is an attractive shrub originating from Japan. It has an upright, bushy habit and can grow up to 2m tall. 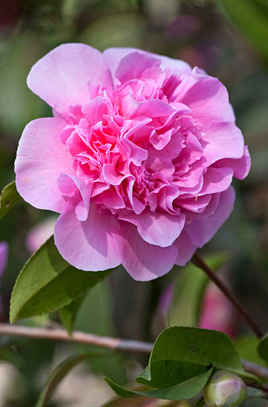 Camellia Debbie is smothered in masses of 3-4in (7-10cm) sugary pink flowers from April-May. A background of rich, evergreen foliage of oval, glossy, dark green leaves provides the perfect contrast. Excellent for adding to mixed shrub borders, as hedging or even for growing in large tubs on the patio. 9cm pot grown plants supplied.